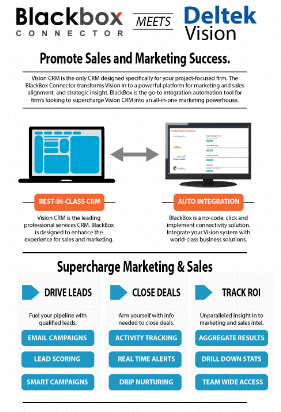 Manage your Constant Contact email campaigns directly in Deltek Vision CRM. Manage your outbound campaigns with the MailChimp Connector for Deltek Vision. See how Concur connects to Deltek Vision. Utilizing the Blackbox Connector truly saved us hours upon hours of manual time by automating a connection between two previously maintained systems. Blackbox Connector was truly a life saver for us!